The good news. It's a double elimination tourney, and the #1, 2 and 4 seeds lost. The bad news. The #3 seed (UGA) also lost and now play from the loser bracket. The really bad news. We've got to play UK to make get our feet back under us. Luckily, the Cats play better in parks smaller than The Met. Plus, we just took 2 of 3 from them. 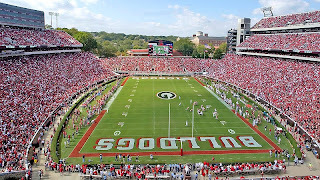 Georgia Tech beat Miami as well, so it's looking more likely "right now" that we'll be hosting you in Atlanta as opposed to the other way around. All subject to change in the next couple of days, of course. Nathan - I just can't see the ACC getting 3 teams as Super Regional Sites while the SEC only gets one.